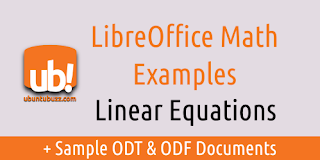 This article provides linear equation examples for LibreOffice Math. You can write every code here in Math's input textbox and it shows the beautiful equation directly. And you can also write every code in LibreOffice Writer document. Finally, you can download the sample documents (.odt & .odf) below containing all equations. This article is intended for teachers so they can use LibreOffice for all mathematic documents in schools. 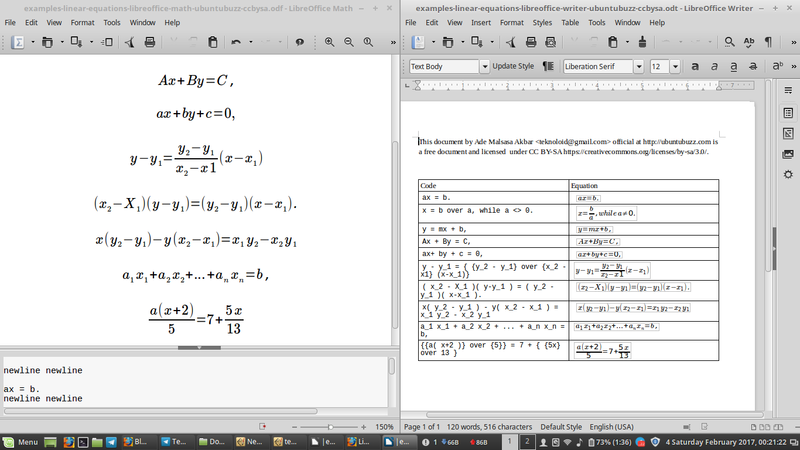 If you wonder how the code looks in both LibreOffice Math and Writer, here is the picture. Left is Math and right is Writer. x = b over a, while a <> 0. ( x_2 - X_1 )( y-y_1 ) = ( y_2 - y_1 )( x-x_1 ). I think it's essential for all users to get the example documents so here you can download all linear equations above in Writer and Math formats. All documents are licensed under CC BY-SA 3.0.